A social transformation of profound proportions has been unfolding over the second half of the twentieth century as women have turned from household work to wages as the key source of their livelihood. This timely study, a broad comparative analysis of African American women’s and white women’s changing relationships to home and work over the past forty years, at last provides a wide-ranging overview of how this shift is influencing the shape of families and the American economy. Susan Thistle brings together diverse issues and statistics—the plight of single mothers; the time crunch faced by many parents; the problem of housework; patterns of work, employment and marriage; and much more—in a rich and engaging analysis that draws from history, economics, political science, sociology, government documents, and census data to put gender at the center of the social and economic changes of the past decades. 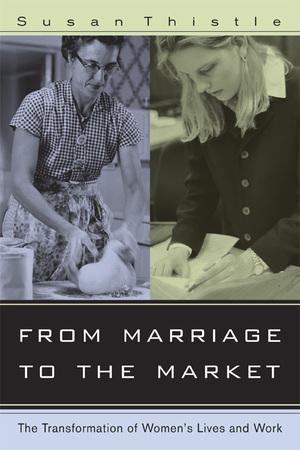 With its broad historical and theoretical sweep, clear charts and tables, and accessible writing, From Marriage to the Market will be an essential resource for understanding the tumultuous changes currently transforming American society. Susan Thistle is Associate Chair and Faculty in the Department of Sociology and Faculty Associate at the Institute for Policy Research at Northwestern University.